Are you familiar with the sugar glider? Teeny, off-the-charts-cute, flying mini-opossums with huge eyes? Apparently, they make great pets. I had reservations when seeing pictures of Alita, the little brunette girl with the freaky, giant eyes. But she very quickly becomes like unto the sugar glider, in one’s mind. She’s endlessly cute and adorable. And also as cool as Bruce Lee. Which is a powerfully attractive combination. I see that a fair amount of my critic brethren and sistren don’t love “Alita: Battle Angel,” but I think it’s going to be enormously popular. And if director Robert Rodriguez and producer James Cameron stay on board for the next one—a successful franchise. The Rodriguez and Cameron team turned this Yukito Kishiro-penned, sci-fi graphic novel into a many-movie mash-up; it’s “Star Wars,” “Blade Runner,” “Rollerball,” “The Blood of Heroes,” “Robocop,” “Edge of Tomorrow,” and many more. But it feels slightly similar to how “Star Wars” and “Robocop” first impacted audiences. There’s a palpable feeling of: I’ve never really seen anything quite like this before. Of course, we’ve more or less seen it all before; we’ve reached a point of sci-fi saturation. It’s all been done; there’s nothing new under the sun. Yet “Alita” is definitely fresh, and also one of the rare movies these days that really lends itself to being seen in 3D. The story takes place “300 years after the Fall.” How many apocalyptic, dystopian movies can you name that refer back to the time when humans finally, completely, trashed themselves and the planet Earth? There are many, many of them. We live in the time the ancient Chinese called the “Last Havoc,” so we like to look at lots of last-havoc movies. You know the deal: The machines take over; artificial intelligence becomes sentient and discovers it doesn’t like humans; and androids, cyborgs, robots, predators, and terminators are running around everywhere, Wall-E is sorting stuff in his dump-yard, Mad Max is blowing away gasoline thieves, Kevin Costner’s growing gills because the seas have risen, everyone looks like they just got back from Burning Man, and everybody’s a bounty hunter. Oh, and thanks to Jason Bourne, lots of characters nowadays can’t remember who they are (an archetypal metaphor for human existence, which is why it’s such a popular theme). And so our wee heroine, Alita, can’t remember who she is. That’s because she’s mostly cyborgian. She’s part Pinocchio and part Frankenstein’s creation, in that she’s discovered lying on a trash heap by Dr. Ido (Christoph Waltz), a Geppetto-like cybersurgeon living in Iron City, which is situated underneath Zalum, a vast, floating aerial city from whence the trash-heap falleth. 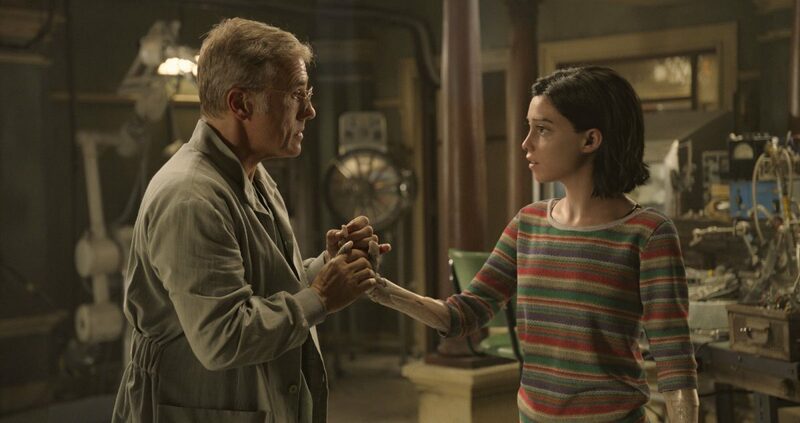 Like Dr. Frankenstein, Dr. Ido cobbles and solders and jerry-builds her back together again, using a cyberbody meant for his late daughter, Alita, and so he gives her the same name. After basically reconstructing his daughter, he immediately goes into dad mode and sets up rules and curfews. However, his little creation is basically a highly curious and impressionable tween, and soon there is love of chocolate, and oranges, and a dreamy, sweet-faced, motorcycle-riding bad boy (just a little bit bad) named Hugo (Keean Johnson), a street-smart hustler with heart. It’s during one of their hop-on-his-motorized-unicycle dates—when Alita is accosted by a hulking, arachnid robocop—that she discovers something odd. Like Jason Bourne, Alita’s body, when threatened, automatically assumes sophisticated defense postures, and later explodes with an exotic strain of highly lethal kung fu. It’s really that bit of Jason Bourne-business, where the cops prod him with nightsticks and he explodes with jiu-jitsu, surprising himself, that we’ve come to love and now want to see over and over again, like a bedtime story. But, like Bourne, Alita needs to know her true purpose. Our purpose is to “get back to the Garden,” right? Well, in Iron City, the purpose of life is to be allowed to ascend to Zalum. Only there aren’t any gods up there, just a more refined, better-educated class of people, apparently. It’s a caste system, with the elite hovering above, in a metallic paradise. But some Iron City denizens get to go up there sometimes. How do you do that? By raising your moral standard and letting go of your earthly attachments? No, you get involved in the national pastime of motorball and try to become the No. 1 champion (which is where “Alita” is akin to 1989’s “The Blood of Heroes”). Motorball is a mash-up of games from “Rollerball” and “Robot Wars,” with cyborgian-enhanced human athletes, all of whom display psychotic levels of meanness. We’ll come back to motorball. Meanwhile, we’re led on a journey of discovering Alita’s past. 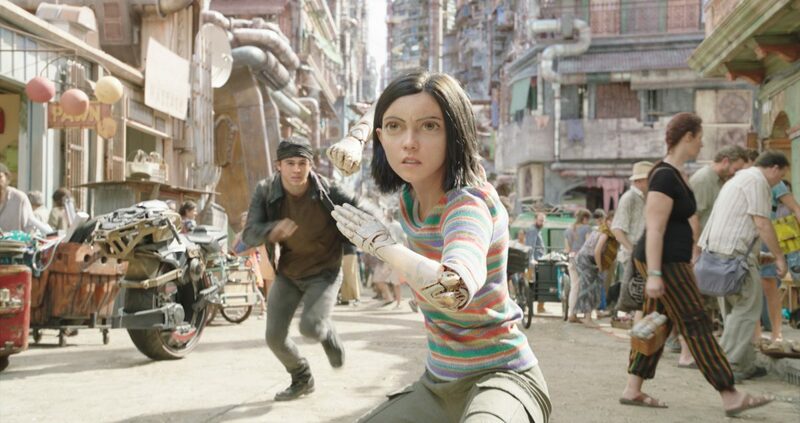 On a teen hike to see a partially submerged spacecraft relic, Alita boards the ship and discovers it responds to her commands. She returns home carrying a futuristic cyborg body from one of the ship’s display cases. Being that the battle-bod is from Mars, the warrior planet, and Alita’s a cyberwarrior designed to be drawn to conflict, how well do you think martial arts skills from Mars will adapt to motorball? Easy-peasy, lemon-squeezy. But we’re getting ahead of ourselves. Before motorball arrives on the scene, Alita figures out Iron City’s hidden dangers. There’s basically a lot of highly corrupt organ-harvesting going on. 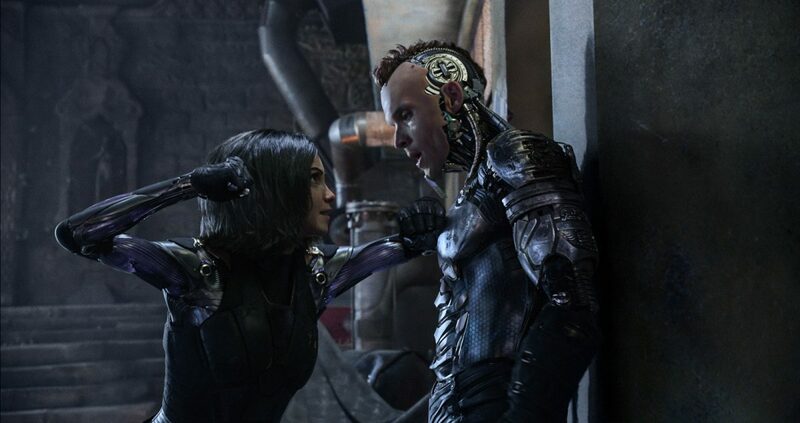 Cyborgs, like the hulking Grewishka (Jackie Earle Haley), decimate humans, other cyborgs, and robots, and strip them for parts, and the parts go to the slinky Vector (Mahershala Ali) who pays top dollar. Well, the highly altruistic, benevolent, and pure Alita decides she’d like to become a so-called Hunter Warrior and help decrease the surplus population of organ-harvesting cyborg (and human) scum. However, Vector’s figured out that Alita’s got a Rolls Royce-quality battle-bod with a heart that’s got all kinds of superpowers. I couldn’t comprehend the pseudoscience; let’s just say it’s sort of like that shiny thing in the middle of Iron Man’s chest, and functions like ancient martial artists’ use of chi and gong energy in its ability to shatter and demolish stone and steel. Vector wants her heart. The hunt is on! Meanwhile, Alita’s memories of her previous “incarnation” flash back more frequently, and she realizes her powers and talents need to be in service of liberating her loved ones, and indeed, all of Iron City from the (highly communistic) Zalum. Zalum? Yes—a strange intelligence moves in and out of people and cyborgs alike, signaling its arrival by turning Vector’s brown eyes blue. (I would have enjoyed hearing Crystal Gayle’s “Don’t It Make My Brown Eyes Blue” in the background on these occasions.) This malevolent (and funny) being or intelligence stems from a hidden mastermind in Zalum, who strings along the good people of Iron City with dreams of ascending to a better realm of existence. It’s a complicated movie in the telling—but not in the watching. The action throughout is outstanding. Motorball, bar fights, back-alley showdowns, sewer death matches, from the best of Bruce Lee to the bullet-defying slo-mo CGI of “The Matrix”—it’s all brilliantly choreographed and an extremely fun adrenaline rush. Also, since this is James Cameron of “Avatar” fame, a producing master of believable world-building in other realms and levels and dimensions, you’ll find this particular world believable down to the smallest details. 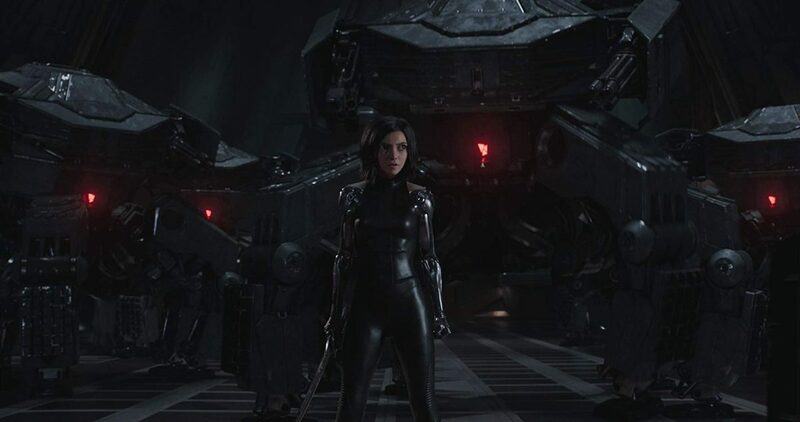 And yet, while this movie is action and world-building writ large, what’s most compelling is the moral core of Alita, represented by that powerful energy in her cyborg heart. Which she at one point pulls out of her chest and offers to Hugo. To which he replies, “You shouldn’t just give things to people.” That’s the kind of pure soul she is. 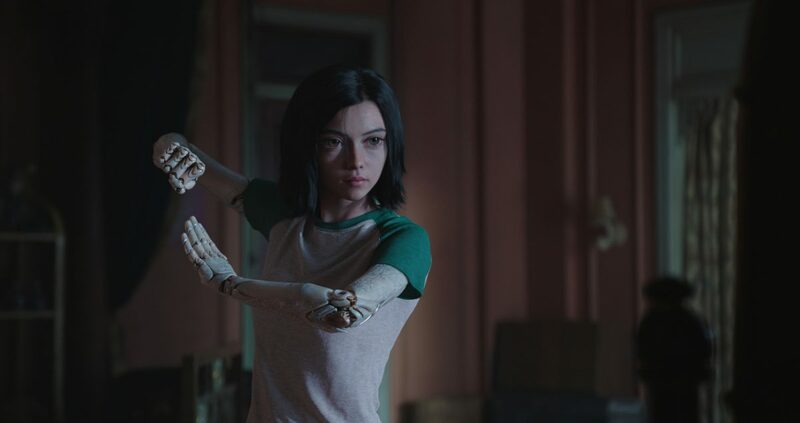 Alita displays the power of an inner and outer discipline; we see her train martial arts, but we realize she’s undefeatable because of her ability to distinguish right from wrong, virtue from vice, and give to those she loves and those in need, with no need for fame or reward. This is inspiring and uplifting to both her “father” and “boyfriend” alike. It’s also inspiriting to the audience. Very angelic, indeed.